Asheville, NC, 2017-Apr-25 — /EPR EDUCATION NEWS/ — Newly revised Civics Handbook hopes to make a contribution to Civics Education. It presents you with a wealth of information about early American history and Civics, as well as the U.S. Citizenship Test. It allows you to examine your own knowledge and civics proficiency. Think “Cliff Notes” for a handy resource and reference on the subject. And while learning basic information, the author hopes you might be inspired to visit, see and experience where some of American history unfolded, as Historic Sites, Parks, Battlefields, Sites of Remembrance and National Parks are listed in the book. 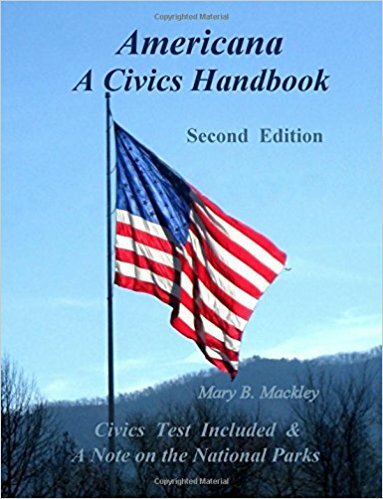 Americana A Civics Handbook Second Edition was released in June 2015 by Mary B. Mackley of Asheville, NC, and was revised January 2017. It is an award winning Finalist in the History, United States category for the 2016 Best Book Awards. There has been an increased frequency and an almost urgent drumbeat of stories reporting a lack of knowledge of Civics and American History in our schools and among our citizens. If there was ever a time to have informed and engaged citizens, it is now. Our recent primaries and election shined a spotlight on this urgent need for Civics Education. How we are to govern ourselves is described in our founding documents. The Constitution teaches and guides us and is the Supreme Law of the Land. The question, is there a crisis in Civics Education, is on the minds of many people. The point has been made … there is a knowledge deficit and room for improvement … Comedians have jumped in to poke fun at and point out this knowledge deficit. While this may seem amusing at first, when you really think about it, it is not so funny and quite sobering. Our Sixteenth President, Abraham Lincoln, said, “I am a firm believer in the people. If given the truth, they can be depended upon to meet any National crisis. The great point is to bring them the facts…” This book brings you some of the very basic facts regarding Civics and our early history. It is nonpartisan and not political. The Declaration of Independence, the U.S. Constitution, the Bill of Rights; facts about early America, the Original Thirteen Colonies, U.S. Presidents, the fifty states, Electoral College, National Symbols, U.S. Wars and more are included. It offers a beginning in learning the basics, and then there is always more to learn. Over 50 pages of historic sketches offer an additional visual dimension in appreciation of our history and heritage. Facts presented will help the reader have more understanding of the questions and answers on the topics covered by the U.S. Citizenship Test. Having a basic understanding of civics and civic participation is important for the health of any country. The book would be enjoyed by young students in Middle School and High School, through Adults wanting to learn and review the information. High School Students newly required to pass the U.S. Civics Test would also benefit from this book. As a bonus, you will have your own copy of the Constitution. Mary B. Mackley, a nurse for 30 years, embraced the role as teacher in working with her patients throughout the years. Her passion for History and Civics began in her youth with inspiring History teachers, participating in the Girl Scouts, in AP History classes through St. John’s University, and the time she spent providing interpretive guided tours and programs at a National Historic Site during and after college. For more information about Americana A Civics Handbook Second Edition and the author, please visit (http://www.civicshandbook.com). You can contact Mary B. Mackley via this website, by phone at (828) 606-7263 or at civicshandbook@aol.com.